Jonathan Carrick is a white child sold into slavery after the Civil War — a forgotten chapter of Americana — and cruelly treated by his master and his master’s son, George, who becomes the object of a hatred that endures half a century. Jonathan’s escape to a new life as a railroadman, then as an itinerant preacher, opens up a new world for him. But within him lies the need for revenge — his own private war against George — that must be satisfied. 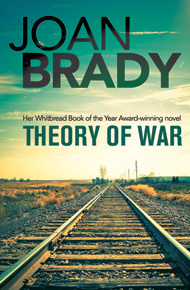 Theory of War received a national Endowment for the Arts Fellowship in the US, won the Whitbread Novel of the Year Award and the Whitbread Book of the Year in the UK and won the Prix du Meilleur livre Étranger in France. It was number 1 on UK and French bestseller lists and has been translated into nine languages.